Shut down unit and lock out electrical power supply. Recover and dispose of refrigerant charge per the EPA Guidelines. Includes crane and rigging service. Remove and properly dispose of existing units. Install two (2) 5 Ton new packaged rooftop units onto existing curb adapters. Install new refrigerant lines and Connect to existing supply and return ducts. Connect electrical to existing unit disconnect. Install new electrical and conduit from junction box to unit disconnect and terminal board where new unit footprint requires this. Reconnect existing electrical and control wiring. Install new condensate drain lines as needed. Provide Lennox factory start-up and First Year Warranty. Provide a Certified Test and Balance on each new unit to confirm supply air Cubic Feet per Minute (CFM). 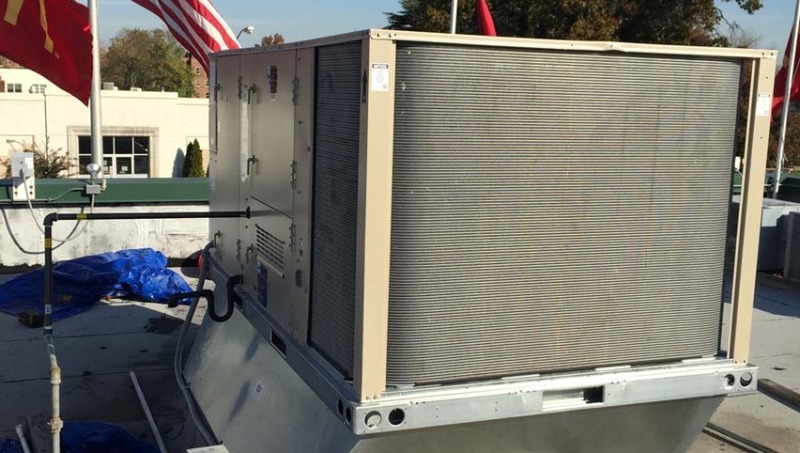 The goal was to successfully install the equipment and furnish materials, supplies, labor, and hardware to remove and install two (2) 5 Ton Lennox Rooftop Air Conditioning units.